Susie Blaha is the 4th generation of a Boulder ranching family. 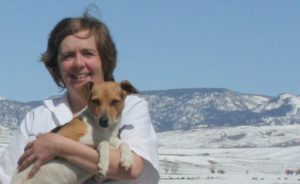 She graduated from the Colorado State University School of Veterinary Sciences. She returned to Sublette County to establish a practice including small animals, horses and cattle. Her family is still operating a working cattle ranch along with the veterinary profession. Dr. Blaha has a special interest in both small animal and equine dentistry.